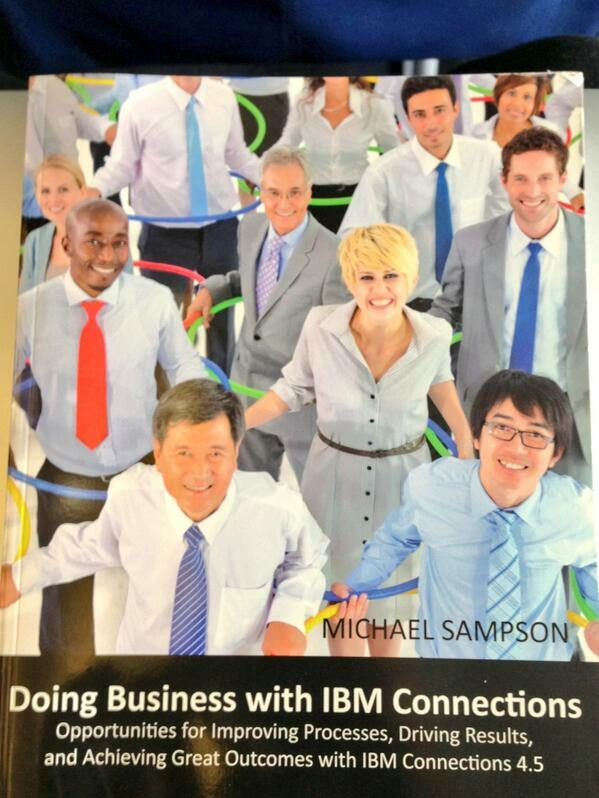 Thanks to a long flight yesterday, I just finished going through Doings Business with IBM Connections: Opportunities for Improving Processes, Driving Results, and Achieving Great Outcomes with IBM Connections 4.5 written by Michael Sampson. You will notice that the title of this post mentions the IBM Connections Suite and I'll get to why soon. Michael Sampson is an independent consultant focused on helping organizations optimize collaboration. After going through the book, I must say that this is going to be a recurring recommendation to all current and prospective customers. The book is intended for collaboration strategists, line of business managers and users of IBM Connections. I think the book hits the mark and is perfect for that intended audience. For each collaboration scenario, Michael follows a consistent flow. First, describe what the collaboration scenario is and how organizations typically tackle this (i.e. "the old way"). Next, a typical work scenario is laid out to highlight the challenges that users face today. Next, the process is clearly laid out on how to use IBM Connections to solve this challenge (i.e. "the new, faster, better, optimized way"). The author does a tremendous job of not only giving you a set of steps to follow, but also explains why he is providing that recommendation. Next, each scenario includes case studies from customers that have been successful using Connections for the particular collaboration scenario (and it even includes customers that I hadn't heard of before!! ). Finally, each scenario has a section for Advanced Concepts where the author provides additional best practices (e.g. when talking about ideation, he references how to avoid a repeat of the "suggestion box"). Throughout the book, the author constantly emphasizes the IBM Connections Mobile apps, which I believe recognizes the increase demand of the mobile workforce and strategies for bring your own device (BYOD). Additionally, the book is not limited to just the core Connections product but includes real-time meetings, document libraries and more which are all capabilities of the IBM Connections Suite. This book provides independent advice on how to drive business with IBM Connections, accelerate adoption, and reduce time to value. To purchase a copy of the book and/or learn more, go here. Disclosure: I wrote a quote for the front page of the book and received a copy of the book.